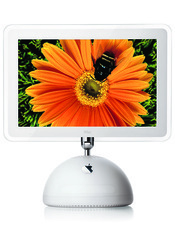 The Apple iMac G4/1.25 20-Inch (Flat Panel) features a 1.25 GHz PowerPC 7445 (G4) processor with the AltiVec "Velocity Engine" vector processing unit and a 256k on-chip level 2 cache, 256 MB of RAM (333 MHz PC2700 DDR SDRAM), an 80.0 GB Ultra ATA/100 hard drive (7200 RPM), a tray-loading 4X "SuperDrive", NVIDIA GeForce FX 5200 Ultra graphics with 64 MB of DDR SDRAM (AGP 4X support), and support for AirPort Extreme (802.11g) and Bluetooth with optional cards. Details: This model has a 20.0" TFT active matrix display with a native resolution of 1680x1050. It also supports "1344 by 840, 1280 by 800, 1024 by 640, 840 by 524, and 800 by 500 pixels at 16:10 aspect ratio; [and] 1024 by 768, 800 by 600, and 640 by 480 pixels at 4:3 aspect ratio." Apple reports a "typical" brightness of 230 cd/m, contrast ratio of 350:1, and viewing angle of 120 degrees horizontal and 170 degrees vertical. Details: *In inches - height x width x depth - minimum (35.4 cm, 44.0 cm, 27.0 cm). The maximum dimensions are 20.9 inches x 20.2 inches x 17.3 inches (53.0 cm, 44.0 cm, 27.0 cm).